Watch video above to see all the FIVE INGREDIENT VEGAN RECIPES I ate throughout the day… Scroll down to see the written recipes! As you might know, I LOVE a short ingredients list. To the point, precise, easy to read, easy to follow and EASY TO SHOP FOR. Cheaper, too, since you don’t have to buy five million ingredients. I always find myself avoiding recipes with huge ingredients lists – anyone else do the same?! The good news is that you DON’T have to have a large list of ingredients or make things complicated just to have a great, NUTRITIOUS, meal. In fact, some of my favourite things to eat are simple and uncomplicated. Some people might even argue that eating simple meals can be very healthy as well. So I wanted to see if I could spend all day eating ONLY five ingredient recipes for all meals and snacks. Since I’ve already done a bunch of “five minute” recipes on my YouTube channel, I thought it’d be a fun idea to turn this into a full day of eating. Of course, as always, any of these can be tweaked. You can add ingredients, subtract ingredients, make it your own. These are simply some ideas for you to go by and what I came up with when it comes to 5 ingredient recipes. It was so much fun trying to creatively come up with meals that were only 5 ingredients but I can say with confidence that everything was super delicious!!! 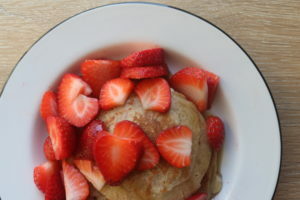 I’m so impressed that such simple ingredients can bring such yummy results. So watch the video above to see EVERYTHING I ate in a day including breakfast, lunch, dinner AND snacks! And scroll down to see the very simple list of ingredients and instructions! Add oats, banana and non-dairy milk into a food processor or blender and blend until completely smooth. 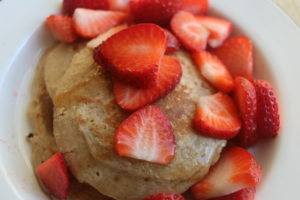 This is your three ingredient pancake batter! In a non-stick pan, heat a little vegetable oil on medium-high heat. 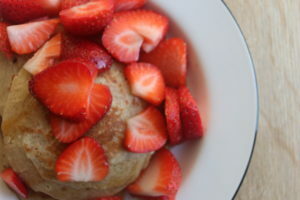 Then pour in the batter into pancake shapes. I like to let it cook on one side for a few minutes (around 5-6 minutes, but depends on your stove) and flip over. Cook until each side is slightly browned. 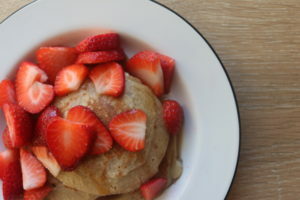 Top with whatever toppings you desire – I topped mine with maple syrup and strawberries! 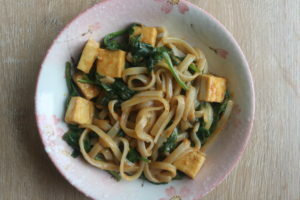 In a large wok or pan, fry up the tofu with a small amount of oil on medium-high heat. 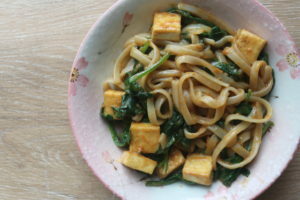 I like to cook the tofu until it is golden-brown on the outside and crispy. 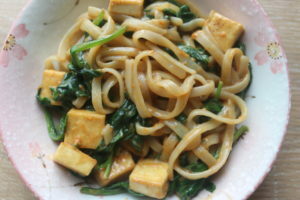 While the tofu is cooking up, you can prepare the rice noodles according to instructions. 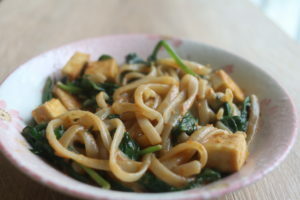 Once the tofu is cooked, put aside and in the same wok, add the coconut milk (coconut milk likes to separate in the can, especially if it’s full fat. Make sure you mix it well so it’s not too chunky and more liquidy. Add the Spiceology Thai Peanut Curry Blend and mix until well-combined – this is going to give your noodles those delicious Thai flavours! Add more if you need. 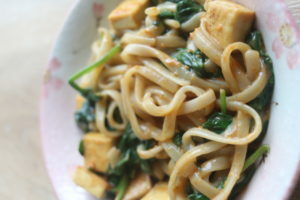 Throw in the cooked noodles and tofu and mix well until everything is well-coated. 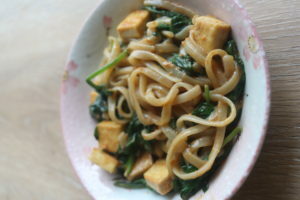 Turn off heat, throw in the baby spinach and mix until spinach becomes vibrant green and wilts. Add salt to taste and ENJOY! Cook wild rice according to instructions. 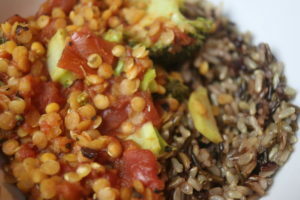 In a wok or pot, add diced tomatoes and red split lentils. Add a splash of water and allow the mixture to come to a boil on high heat. 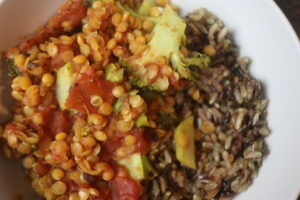 Reduce the heat, cover and let it simmer for about 15-20 minutes (or until lentils have cooked) on low. Keep stirring once in a while and add small splashes of water if the liquid reduces too much. Meantime, chop your broccoli into bite sized pieces. 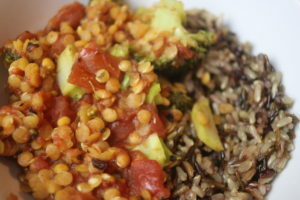 Throw the broccoli and basil in when you have about 10 minutes left to cook the lentils. Add salt and pepper if necessary and enjoy with your wild rice…! k literally the worst photos ever but you get the idea… lol. Heat dark chocolate in the microwave in 30 second intervals (mixing in between) until melted. 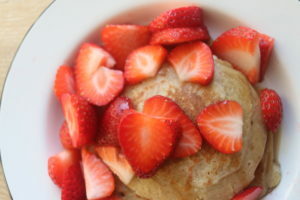 Meanwhile, add silken tofu and maple syrup into a blender or food processor and blend until smooth. Add in the silken tofu mixture into the melted chocolate and mix until well-combined. 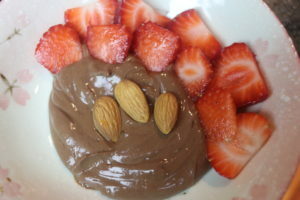 Add additional toppings if desired – I added strawberries (SO GOOD) and almonds. 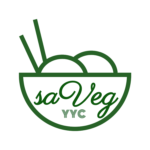 Try Some More Of Our Amazing Vegan Recipes. Tips & tricks on saving money & time by following a Cheap Lazy Vegan lifestyle! Tons of lazy recipes that take less than 15 minutes to make. 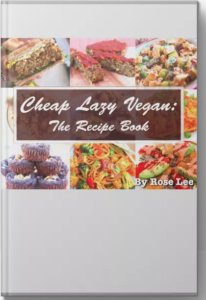 Mostly oil-free recipes. PDF e-Book that you can download instantly after purchase! Use it on the go for your mobile phone, tablet your computer. Thanks for the recipes. Love the 5 ingredients or less. So super simple and on the table in no time. Hi! Love the recipes. 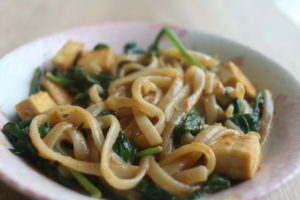 If you don’t have the spice mix for the noodles, what do you recommend substituting? Thanks! Hi Rose, thanks for the recipe. 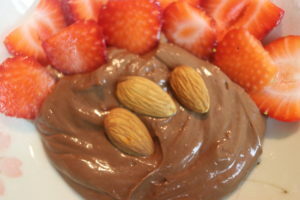 I made the choco mousse, subbing soft tofu for silken(3 stores, no silken at all!) and tripled the maple syrup to sweeten 100% cacao bakers choco. Then I ate the entire 500 calories worth. It was really good and would have been even better with the silken tofu and 60-70% cacao, I’m thinking.